The Voicemail greeting is what callers hear when they reach a User’s voice mailbox. 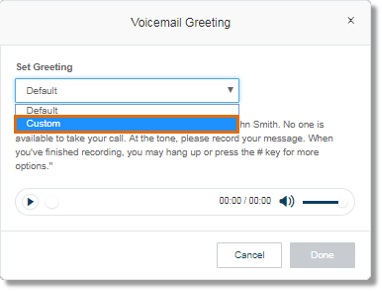 Follow the steps below to learn how to customize the Voicemail Greeting for other Users. Click the Users tab, and then go to the User list. Under the Users with Extensions, click the name of the User that you want to modify. Click Edit under Voicemail Greeting. Select Custom on the drop-­down menu. This option lets you record your own Announcement greeting over the phone. Select Record over the Phone, enter your telephone number in the box provided, then click Call now. Office@Hand will try to reach the phone number you keyed in, after which you will be given instructions on to record your greeting. Selecting this option enables you to record your own Announcement greeting using your computer’s microphone. Click Allow when prompted to enable the microphone. The Microphone test and record settings will appear. When ready, click the red Record button to record your company greeting through your computer microphone. This option allows you to upload a customized pre­recorded audio file stored on your computer/device. Click Import, then click Browse. Note: After you click Browse, you will see a pop­-up window where you can locate and select the file that you want to use as your Voicemail greeting. Office@Hand recommends .wav or .mp3 audio formats in the following compression types. Note: You can select Default anytime you want to switch back to AT&T Office@Hand’s default voicemail greeting, then click Save.